While a focus on aerodynamics in mechanical parts of the car may sounds like a contradiction, it can greatly reduce drag. The new TF108 certainly stands out from previous Toyota cars as it has been improved and simplified all over the body. As marked in the picture, the new version is still a zero keel suspension-wise but has turning vanes extending on the keels. All suspension arms have also been revised (you can see the old version in the inset) while the geometry has remained largely unchanged. 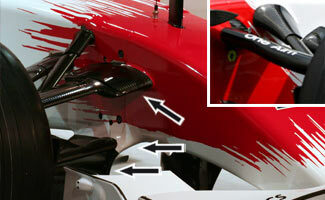 Small improvements have however required that the top of the nose is now slightly bulged where the push rod attaches.